You might think it’s easy to come up with way more than FIVE top reasons. Go ahead. Start listing. It’s not as easy as it might seem. After all, have you even thought about intentionally touring American Victorian Era museum houses that are open to the public? Why would you even want to visit a musty, old house? 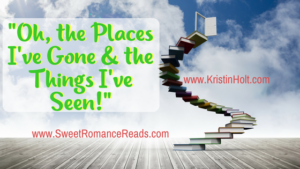 You read books set in the era, love them enough to pick up another, enjoy visiting the past and its various locales… so what’s to be gained by physically setting foot in a house that was built (and lived in) during the time period? Authors intentionally provide readers just enough detail about a setting (the interior of a parlor or front entryway, for example) to allow your imagination to take over and fill in the blanks. This is done with good purpose: readers tend to skim over the “boring” stuff (description) to get to the “good stuff” (action or dialogue). The more you have learned by personal experience in observing a Victorian home (simple, rural, fancy, ornate, uptown), the more prepared your imagination will be to fill in the setting. Do you know what a mid-19th Century egg separator looks like? Have you ever seen a chamber pot? How about wardrobe or wash stand? A cast iron stove? Authors may mention household items in their Victorian-era books, but if you’ve never seen one, your imagination may draw a blank when asked to pull up a likeness. Having seen such items, whether on display in a museum or in the natural setting of a home built and lived in during the period, will enrich your reading experience more than you might expect. Visitors will notice tiny things that may or may not make their way into a book. Heights of window casings. The “gingerbread detail” of expensive homes’ details. Lower (than today’s) handrails, narrower (than today’s) stair treads, often much higher ceilings. The Flavel House, built in the mid 1880s, in Astoria, Oregon has soaring fourteen-foot ceilings. Visitors might be surprised to learn this house, completed in the Spring of 1866, has two original flushing toilets, sinks with running water in almost all bedrooms, a built-in bathtub in an upstairs bathroom, and a “modern” kitchen with hot and cold running water in the sink and an uncommonly large icebox. Everyday customs and day-to-day normalcy in the Western United States has changed a great deal since the Victorian Era ended roughly 115 years ago. Well-to-do husbands built mansions with an adjoining bedroom for his wife as a sign of his success…and not necessarily because he didn’t wish to have the lady of the house close. Compare this frame of mind with the pioneer and frontier family who often lived in a single room house. Visitors to museum houses will take note of gas lamps affixed to walls, decorative oil lamps on tables, and details that were once every-day fixtures like candle extinguisher. It’s fun to look for pegs in cabin walls to hang aprons, clothing, pots and pans. In the upper-class historical residences, it’s fun to take note of a silver platters for receipt of calling cards. Not only does this broader perspective increase the enjoyment of historical fiction, but it explains much of the background of which these stories are set. Museum Houses are not only a most affordable form of entertainment, they make for an enjoyable family outing. In my experience, entrance fees run about $5 per adult (less for children), and all ages are welcome. Who knows? Discussions while touring an historic residence might spark educational conversations with the children and help a reader’s hubby/significant other to comprehend her fascination with reading historical romances. Hey, it’s worked for me. In my experience, readers of historical fiction (all types, not just romance) love history for history’s sake. We’re fascinated by touring museum houses simply for the pleasure of it. We read historical nonfiction to learn more about the places, events, and circumstances we find interesting such as mail order brides or the Transcontinental Railroad. Entering the preserved and restored rooms and immersing ourselves in the space people lived in is the second-best thing to time travel. 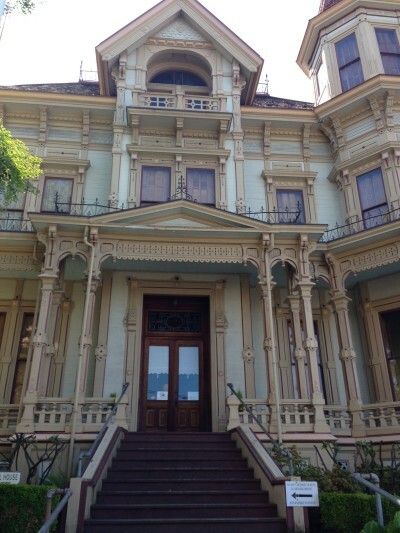 Have you toured historic houses? What do you remember most about those experiences? 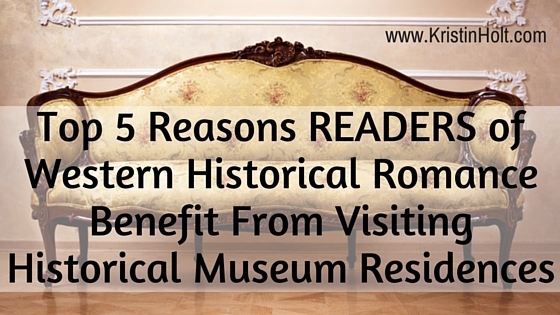 What benefits of visiting museum residences would you add to my list?